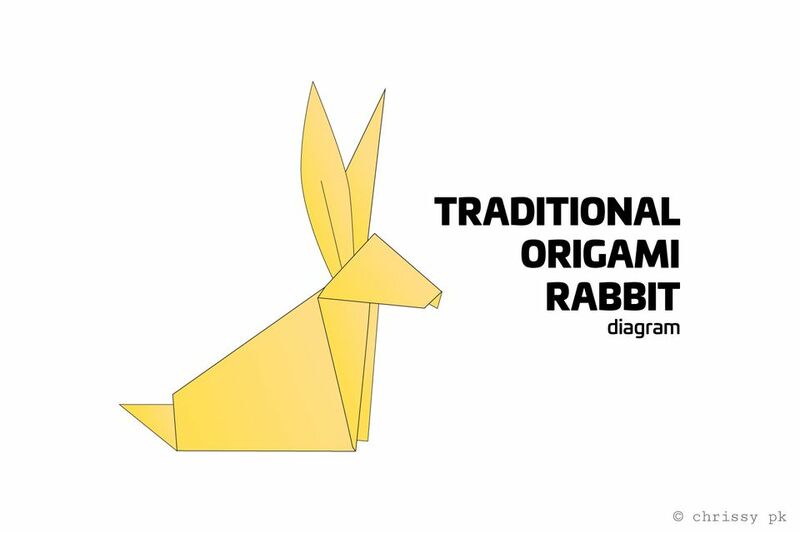 Learn how to make an origami rabbit with this easy to follow diagram. This cute bunny is a great craft for kids and adults to make, you can fold a whole family of rabbits! You will need 1 sheet of square paper for this origami rabbit. Use origami paper or use the thinnest paper you have, using at least 15 x 15 cm paper to start with. Start with your paper white side up or the color that you don't want to see, in this case, the bunny will be yellow. 1. Fold the top corner down to the bottom and make a nice precise crease. 2. Fold both the top left and top right corners down to the bottom point and crease well. 3. Fold the left and right corners up to the top point, again creasing well. 4. Start with the right flap, open it out to the right, pressing the top of it down to form a slanted triangle. Repeat on the left side. 5. Rotate the paper to the left a little. Fold the top section backward and behind. 6. Take the flap which is at the bottom right, and flip it up and behind. This is a rotation movement, not a reverse fold. Repeat on the flap on the back. 7. Fold the ears over to the left as indicated, the ears don't have to all be the same, as it's an animal, it looks nicer with some asymmetrical folds. 8. Hold onto the ears at the 'head'. Open out the left sections, the nose should go downwards, while the left flaps are pushed over the top of the ears on both the front and back of the rabbit. 9. Make the two folds indicted and pleat fold them, the fold on the left is a mountain fold, while the diagonal fold is a valley fold, open out the back of the rabbit to pleat fold them inside. 10. Fold the nose under. This is now complete but I like to fold the ears back out a little. I also like to glue the flaps that stick out from the neck, depending on what type of paper you use. If you have any issues trying to complete this project, consider checking out resources like Paper Kawaii for helpful advice and ideas.